This hawk is either a Cooper's Hawk or Sharp Shinned Hawk. The Cornell "All About Birds" site tells how to tell them apart, and I am leaning toward the Sharp Shinned. But I keep finding little identifiers that I am not sure about (is that tail considered square or rounded; it is maybe too big to be an SS, but maybe it is the female which is bigger? ; etc.). Anyone able to conclusively ID this one? They both eat small birds, and this one was watching my bird feeder. 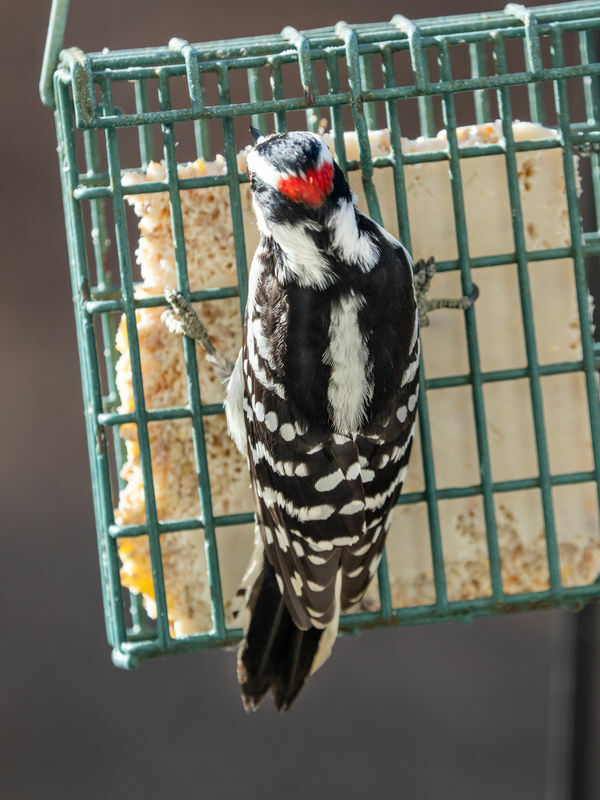 On the suet block was a hairy woodpecker that stayed on the far side of the bloc from the hawk and remained motionless for 5 minutes until the hawk went away (hungry). With the white line of feathers above eye, I am leaning towards an immature Sharp Shinned. Also has a small head. 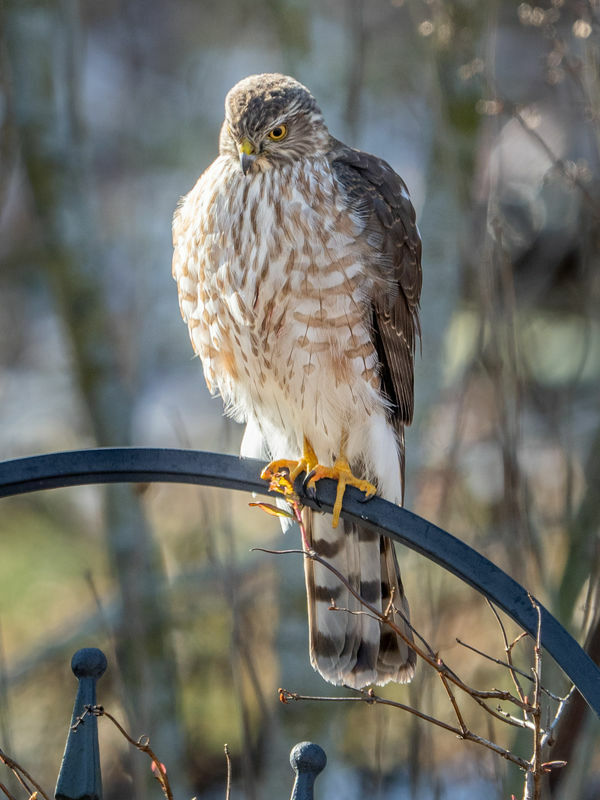 I also was thinking Sharp-shinned Hawk. The tail is squared off, the shoulders broader on top, but I can't remember which one has more forward set eyes. And yes, the head is smaller like a Sharpie. Love the picture, a great closeup. It does appear to be too large for a Sharp Shinned, but the Cooper's head is supposed to be a bit squared off and this head looks rounder. However the immatures heads look rounder and the head has more dark colors for a "hooded" look which is Cooper's. This one has that. My semi-informed W. A. G. is an immature Cooper's. My guess is a Sharp-shinned due to the tail being square. That tail is rounded. It's a Cooper's Hawk. The Sharp-Shinned Hawk tail is definitively square. But the best clue is the size of the bird. The Cooper's is 14"-20" tall and the Sharp-Shin is much smaller at 10"-14" tall. I have both species regularly in my yard terrorizing the birds at the feeders. Great shots.....like them a lot. To large for a coppers I leaning more towards a younger red tail. The feet and legs seem to point to a Sharpie. I have a few Cooper's at mine and their feet are much heftier...nice photo! Thanks everyone! I am going to call it a sharpie. It was interesting to find that I am not the only one having trouble identifying it! I think more of you lean toward sharpie than cooper, and since that is the one I vote for, so be it! White terminal tail-band = Coopers. Female. Great set.